Outdoor Wedding Drapes That Will Leave You Mesmerized! An element of décor that adorns a great space yet goes unnoticed. It has the ability to swirl, twirl, criss-cross and even wrap around – Beau Drapes. The versatility of this one element can make or break a wedding and plays a crucial role in the entire décor set up. Hence, we’ve put together three golden rules to make sure you never go wrong! Always keep the season in mind and match the color of your drapes to them. Don’t be scared to play around with colors and combination of more than two colors and prints. So, there you have it! Scroll through our gorgeous collection for some serious wedding inspiration. Butter yellow and blue – perfect setting for a beachfront set up. Summer drapes – sheer, light and pretty! An ethnic twist to a contemporary set up – Leheriya drapes! 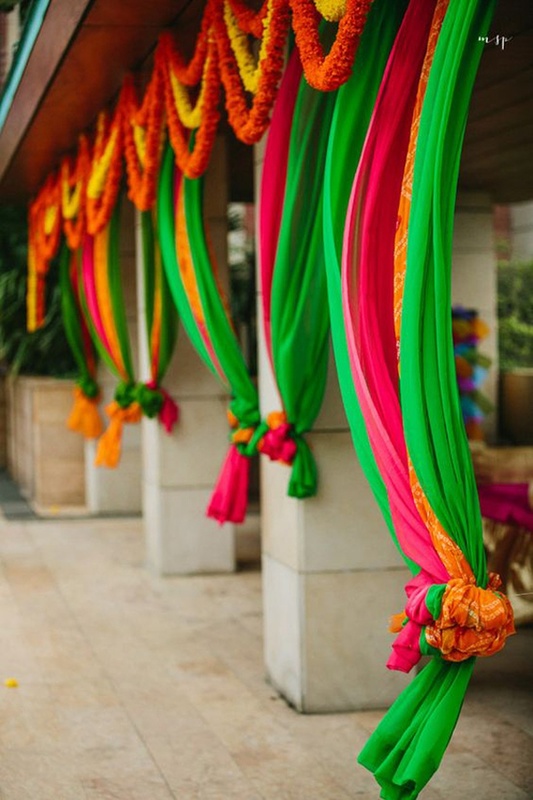 Fuchsia, orange and yellow – desi drapes done right! Orange and blue canopy drapes – always a sight that soothes! The contemporary combination of chrome yellow and white can never do you wrong!